George L. Mosse, a great historian, teacher, mentor, and friend, graced the UW-Madison campus for some forty years, and the Hebrew University campus for nearly twenty years creating a diverse and enduring international intellectual community. Professor Mosse’s bequest makes it possible for advanced graduate students at both schools to study within an international community. 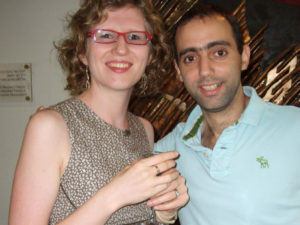 The Graduate Exchange Program allows graduate students from a variety of fields in the humanities and social sciences at UW–Madison and the Hebrew University to spend an academic year at the respective partner university in order to advance their studies and to broaden their intellectual and international horizons. The Hebrew University of Jerusalem has a student body of approximately 23,000 students from Israel and 65 other countries. The University is ranked 27th in the world and in the past decade Hebrew University faculty have won seven Nobel Prizes. Submit completed applications via email to Skye Doney. 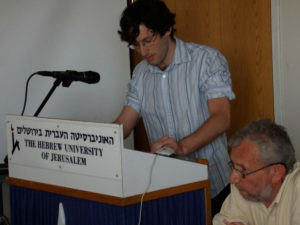 2007 Fellow Udi Greenberg gives a paper as Professor Steven Aschheim looks on. Being in Jerusalem allowed me the opportunity to become an associate fellow at the Albright Institute of Archaeological Research for the year. There I attended workshops and dinners with scholars. I went on many field trips to archaeological sites in the land and attended tours by the scholars who had dug at those locations. There is no substitute for being able to see the sites and findings first hand. My wife and I also had the opportunity to travel to Egypt, Jordan, Greece, and Turkey. It was fascinating to be able to connect Aegean culture and pottery with the Philistines in Canaan or to see Istanbul and connect that land and culture with the later Turkish Period before the British Mandate. We were exposed to all kinds of political and cultural ideas that help us to be more informed about life in the Middle East. We are so grateful to the Mosse Graduate Exchange Program for giving us this outstanding opportunity. I have already seen the academic and personal benefits of my experiences and I know that these will continue throughout my academic work and career. Beyond the Hebrew University campus, I also have the privilege of spending significant time with the poet and scholar Hamutal Bar-Yosef (Ben Gurion University) who I had first met during her academic visit to UW-Madison in the Spring of 2012. While offering me insightful suggestions about my research in Hebrew language poetry, Hamutal also introduced me to the poet Miron Isaacson (Bar Ilan University) and to the stimulating complexity of his work. Additionally Hamutal encouraged my interest in translating Hebrew poetry and sought my advice on in-progress translations of her work as they were prepared for publication, to which I responded with extensive comments. This step from Madison into the literary communities of Jerusalem was extended significantly over the course of my stay. I had the privilege of meeting promising young Israeli Jerusalemite poets such as Roni Mazal, Meitar Moran, and Amir Menashehof, and of attending their “Omrim Shirah” reading series, housed in the gallery of beautiful Beit Ticho. I also spend significant time with poets and translators Linda Zisquit, Tamar Katz, Gabriel Levin, and Peter Cole, all of who are ex-pats who have lived in Jerusalem for many years now. Tamar Katz (Ben Gurion University) who translated revered Israeli poet and Talmud scholar Admiel Kosman, kindly provided me with an electronic introduction that allowed me to initiate a correspondence with Kosman that has importantly informed my work. Gabriel Levin, who in addition to his own work as a poet and translator, edits the important press, Ibis Editions, was incredibly generous to me, meeting with me nearly every month I was there and offering me countless reading suggestions from his wealth of knowledge in both ancient and contemporary Hebrew and Arabic poetry. My stay in Madison has indeed been extraordinary and rewarding for more than one reason, both from a scholarly perspective and from a personal point of view. Apart from the excellent facilities and collections which, as mentioned above, I was able to peruse, I cannot describe how warm and generous was the welcoming of all the Friends of the UW-Madison Library, of Liz Nevers in particular, and how much they helped me while preparing my trip and during my stay. Al Friedman and his wife Susan, especially, were the kindest and the most extraordinary guests I could have desired for my stay in Wisconsin. Moreover, the community of scholars of Madison has been incredibly generous with me, both with their time and advice, especially John Tortorice and Stanley Payne. The privilege I had of talking with them, the suggestions they were able to share with me about the collections and about my researches more in general, and their great kindness in sharing with me also their knowledge of Wisconsin and of the UW itself have been invaluable. For all these reasons, I firmly believe my stay in Madison has been crucial for my researches and I will keep the Friends and the George L. Mosse Program in History informed about any publication resulting from my researches in Madison. My time in Madison was eye-opening on various levels. A particularly great experience was the ambition and the fascination for history I encountered in Madison’s History Department. I have never seen discussions in and out of class evolve as fruitfully and turn out as interestingly as they did in Madison. Maybe I joined a particularly ambitious and engaged cohort, but I was impressed by the passion of the students around me for their subjects but also by way they cared for each other and were interested in each other’s wellbeing and progress. Moreover, I was impressed by the motivation of the many undergraduate students I got to know during the lessons I taught. The way both graduate and undergraduate students and the department’s faculty and staff made me feel at home was special and it made my year in Madison a particularly happy and inspiring one. Finally, I did not only learn what it is like to study on a North American campus. I also discovered the many ways of living in an American city and state. Many of the structures and contexts of the U.S. reality have become much clearer to me simply by living in the United States and sharing the daily experiences of U.S. citizens or by hearing fellow history students talking critically about their political and social system. I am thankful for this kind of education. And of course I enjoyed Wisconsin’s culinary delights: its unlimited varieties of popcorn flavours, beers, and, especially, cheese curds. The experiences and all the wonderful people I met made my stay in Madison particularly instructive, rich, colourful and – simply – very pleasant. My year as a George L. Mosse Fellow at the University of Wisconsin-Madison was one of the most exciting experiences of my life and my professional career. I was able to travel for various conferences in the U.S., to learn from new mentors at UW, to improve my Arabic skills, to focus my efforts on my dissertation, and to enjoy the wonderful environment and social life of Madison. 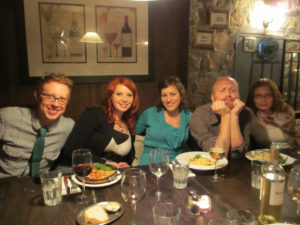 The opportunity to travel across the U.S. for conferences and academic events in my field was a great advantage for me. I gave talks at The Association of Jewish studies annual meeting in San Diego, a graduate workshop at the Taub Center for Israel Studies at New York University, the Association of Israel Studies annual meeting at Brandeis University and the history department colloquium at UW. In addition, and thanks to the fruitful cooperation between the Center for Jewish Studies at UW and the Moshe Dayan Center at Tel Aviv University, I was also able to participate in the mutual conference and present a paper there. During my year I was able to write three lectures as part of my research on the early years of the Israeli occupation over the West Bank and Gaza Strip. These lectures dealt with the relations between labor, land, and demography, with methods to collect information on occupied Palestinian society, and with the relations between the government, military, and social theory. Later I composed a new article, which I am now fine-tuning. Memorial Library is worth mentioning as an excellent place to write, learn, and research. The library services, especially the interlibrary loan department, gave me all the resources I could ask for to efficiently move forward with my work. Furthermore, the working environment in the new study-room for graduate students contributed even more to my efficiency. We enjoyed life off campus: the music festivals, the lakeside Terrace, Union South, walks along (or on) the lakes and the excellent bike paths are only some wonderful experiences we had. It was a fantastic opportunity for me to meet students and faculty at the yearly picnic of the History Department, in the History 701 course and around campus. Our apartment in Eagle Heights (university housing) was comfortable and affordable. I owe a special thank you to John Tortorice, the legendary Director of the Program. Right from the moment we landed in Wisconsin (and even before), John helped us with every question or concern we had, from opening a bank account to showing us the movie theaters. John welcomed us to his home and made sure to check in on us every other day to make sure everything was taken care of. My wife and I will forever be grateful to him. Skye Doney, John’s assistant and previous Mosse Fellow in Jerusalem, was an excellent host and friend. I wish Skye a great deal of success with his new role as Mosse Program Director. Former students of George Mosse who wish to honor their teacher in a way that acknowledged his commitment to teaching, and his extraordinary ability to inspire his students established the George L. Mosse Teaching Fellowship in 1992. Contributions to the teaching fellowship fund by former students, other alumni, colleagues, and friends underwrite one teaching fellowship per semester. The Teaching Fellowship allows an advanced PhD student under the supervision of the doctoral advisor to develop and teach an undergraduate course, and to gain valuable teaching skills. The Mosse Teaching Fellow is considered a part of the Department of History faculty and has full responsibility for teaching an undergraduate class. The fellowship recipient creates the syllabus, selects the textbooks, has an office, maintains office hours, and is listed as the instructor of the course in the timetable. The fellowship comes at an important juncture, as the final year is often the most difficult for a doctoral student to finance. Funding assists the student to complete his or her dissertation in European history, and gain important teaching experience. The Graduate Fellowship Committee of the Department of History chooses Mosse Fellows, with consideration given to the applicant’s academic record and prior performance as a teaching assistant. Outstanding graduate students can be inspiring teachers as they are still in the process of learning and sharing knowledge. Being younger in age, their enthusiasm is especially valued by the undergraduate students. Sharon Elise (Lisa) Cline, Ph.D.
All other researchers will come in under a J-1 Visa. For more information on this program, go to: http://j1visa.state.gov/programs/professor-and-research-scholar. 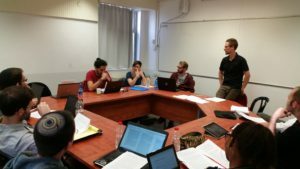 This fellowship is intended to attract and support outstanding Ph.D. candidates who wish to study some aspect of Modern Jewish history in any area of the world. The fellowship package, available only to incoming students, consists of five years of guaranteed support. To apply: Submit an application to the UW-Madison Department of History, specifying your wish to be considered for the Mosse Fellowship in Jewish History on the Supplemental Information for Fellowships and Teaching Assistantships form found on the History Department’s Graduate Admission webpage. UW-Madison History Department fellowships page. Students can also take advantage of the thirty-five faculty from seventeen disciplines associated with the George L. Mosse/Laurence A. Weinstein Center for Jewish Studies, an interdisciplinary program. Tony Michels, George L. Mosse Professor of American Jewish History and Jewish Studies, aemichels@wisc.edu. Amos Bitzan, Frances and Laurence Weinstein Assistant Professor of History, abitzan@wisc.edu. 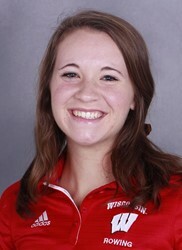 Skye Doney, Director Mosse Program, doney@wisc.edu. This fellowship is intended to attract and support outstanding Ph.D. candidates who wish to study some aspect of LGBT history in any area of the world. The fellowship package, available only to incoming students, consists of five years of guaranteed support. To apply: Submit an application to the UW-Madison Department of History, specifying your wish to be considered for the Mosse Fellowship in LGBT History on the Supplemental Information for Fellowships and Teaching Assistantships form found on the History Department’s Graduate Admission webpage. For more information, visit the UW-Madison History Department fellowships page. Candidates for the Mosse LGBT Fellowship: submit an application to the UW-Madison Dept. of History, specifying you wish to be considered for the Mosse Fellowship in LGBT History on the Supplemental Information for Fellowships and Teaching Assistantships form. Each year the Mosse Program selects 1-2 UW-Madison History Department undergraduate students for the George L. Mosse Program Undergraduate Internship in European and Digital History. Selected students gain experience in digital humanities, public history, and the library sciences. They work with units across campus, including UW Archives, Special Collections, the Oral History Program, and the Wisconsin Historical Society. In the fall of 2017 and the beginning of 2018, I oversaw the creation of a digital history exhibition to commemorate the 100th Anniversary of the end of World War I in partnership with the Wisconsin State Historical Society. The photographs were taken by Eduard Frankl, a press photographer based in Berlin, Germany, taken during World War I from 1914 to 1916. The photographs concern the German war effort, and include scenes in and around Berlin, Poland, Serbia and Bosnia and Herzegovina, Allied prisoners of war, refugees, and the battlefront throughout Europe. This archive had approximately 1,500 photographs. I scanned each photo separately, added it to the Wisconsin Historical Society Database, translated the caption from German to English, and tagged the search criteria for the image. This process took approximately six months to complete and the images are currently being added to the Wisconsin Historical Society website. My job is fun, but I also think it’s important. The kind of help and advice Henry (the other peer advisor) and I give students makes a real difference in their experiences as history majors at the UW. In working with such a large and interesting pool of History majors, I’ve learned a lot about how to tailor my communication efforts to people’s specific needs. I’ve also learned a lot about how to get involved on campus, and how to encourage other students to plug in to all of the resources Madison has to offer. Students come to my office with a variety of concerns, questions and aspirations and we work together to develop a plan to assure the best possible experience for them in the History program. This includes study abroad planning, enrollment questions, and my favorite, course planning. While most student have relatively straightforward needs, creating an effective plan for more complex circumstances is one of the most challenging and rewarding aspects of my work with students. Every day, I see and experience the value of the Mosse Undergraduate Peer Advisor program. Whether I’m making course schedules with students, crunching numbers to ensure someone can graduate on time, recommending classes or discussing what someone can do with a History major, my belief that this program makes a difference is confirmed constantly by students’ praise, feedback and increased use of the advising resources offered by the History department. 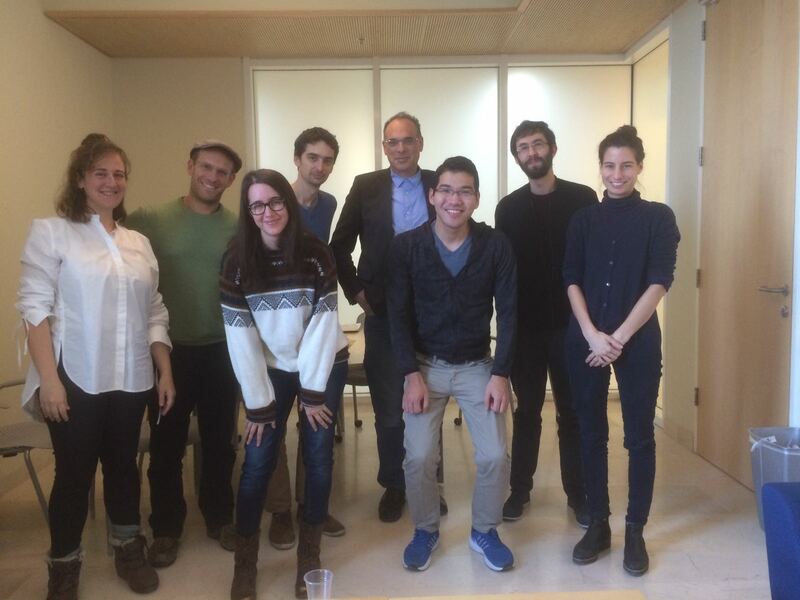 George L. Mosse Faculty Exchange Professor Sean Dinces teaches at the Hebrew University in November, 2015. The University of Wisconsin-Madison and the Hebrew University in Jerusalem. 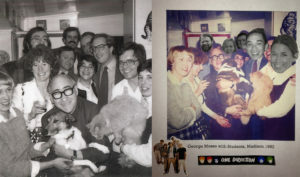 George L. Mosse, a great historian, teacher, mentor, and friend, graced the UW-Madison campus for some forty years, and the Hebrew University for some twenty years creating a vital and variegated international intellectual community. He has provided the Departments of History at both institutions with a generous bequest that aims to make it possible for junior faculty and postdoctoral fellows to experience that community. The Faculty Exchange Program is intended to enable participants to spend an academic year at Hebrew University in order to advance their careers and broaden their intellectual horizons. The exchange provides the time and resources to allow junior scholars to engage in intensive research and writing with limited teaching obligations. Priority is given to faculty in the Department of History and faculty affiliated with the Mosse/Weinstein Center for Jewish Studies, but all faculty members in the Humanities and Social Sciences are eligible. Exchange faculty teach one undergraduate seminar per semester and are available to students and faculty for consultation. Participants may be asked to teach both undergraduate and graduate students. For additional information, visit the Hebrew University, and the Rothberg International School. Diego Holstein, “Medieval Iberia: Conflicts and Encounters”. Fellowship Report.